With more and more people using their mobile devices to find information about local resources and services, and to connect with their favorite causes, having a mobile friendly website, at the minimum, is essential. Mobile apps are a great next step for nonprofits who are ready to engage with their audience in a new way. We found 10 interesting examples of nonprofit mobile apps – which range in purpose and locality. YMCA Greater Richmond – This app allows you to choose among all of YMCA Greater Richmond’s locations and provides information on schedules, events, and programming at each. There are also links to social media sites as well as a donation button. SafeNight – This one that helps domestic violence and anti-trafficking agencies secure funding for hotel rooms when shelter space is unavailable. Users donate through the app, and donations allow staff to connect victims with services and shelter. iCitizen – Described as the “hub for your civic life”, it provides an opportunity for users to get engaged with the political process by contacting their representatives, follow trending issues, and participate in polls. The nonprofit also partners with schools, organizations, and representatives. RVA Folk Festival – One of Richmond’s most iconic festivals’ app includes just about everything you’d want to know about the event – where to park, who’s performing next, a weather alert, and more. Goodwill Locations – More than just an easy way to find your local donation center, Goodwill’s app links users with job search resources, includes blog posts, and has a prominent financial donation button with call to action. Central Virginia African American Chamber of Commerce – This local chamber’s app provides members-only access, in addition to publicly view-able content such as the business directory, events, etc. Run Mo Run! A Movember Game – This fun game app is brought to you by the Movember Foundation. In-game purchases from this app support the foundation, which raises funds for men’s health. The Muse – The Science Museum of Virginia’s app allows visitors to easily find the latest information and interact with exhibits, learn more about the museum, and more. NAMI Air – Recently launched, the National Alliance for the Mentally Ill’s AIR (Anonymous, Inspiring, Relatable) app provides a safe space for those with mental illness to find and give support to each other. Ready Virginia – The Virginia Department of Emergency Management’s preparedness app gives residents access to local resources, a supply kit list, disaster news, tools to create a preparedness plan and an “I’m Safe” feature. 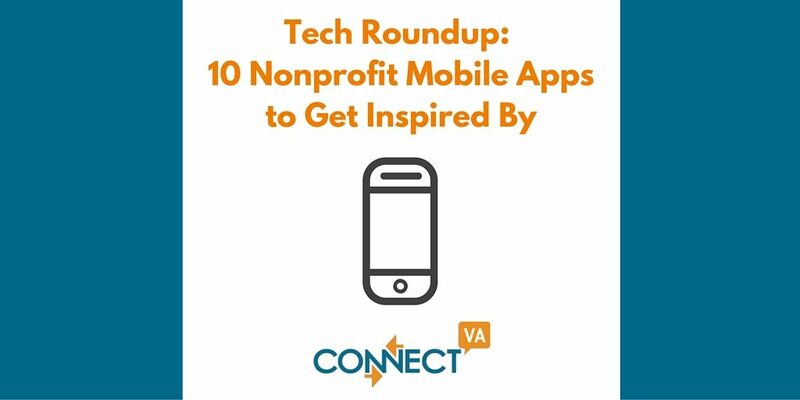 Is a mobile app on your nonprofits’ wish list? We’re excited to announce a partnership with with NS804 Apps & Commonwealth PR to offer the development of an app, free of charge, to one local nonprofit – including conception, development and marketing! How can you win? All you need to do is enter a simple 1 to 3 minute video (phone videos encouraged)! Not sure what kind of app you should develop? No problem – we want to hear your organization’s mission, plans, ideas and goals and then we will select a winner! Only official registered nonprofits can enter and must provide proof of nonprofit status if chosen as the winner. Entering the contest also means that you are willing to have your organization and the final app promoted via public relations, social media and marketing tactics. The value of this prize is between $100k – $150k! Thank you NS804 and Commonwealth PR for this amazing opportunity for local nonprofits to make an impact through technology. Want to see what NS804 can do? They developed the Tilton Alumni app for Tilton School. Visit the contest page on NS804’s website to view more instructions and upload your video by June 3rd!